A Love Restored is based on my true-life love story with my husband, Mike—all of our ups and downs, including our emotionally devastating break up. Like my full-figured heroine, Ruth Ann, I’ve struggled with weight issues my entire life. That struggle plays an important part in our story. My own journey to self-acceptance, as well as what a loving God will do to grab a stubborn woman’s attention, are pivotal to the story line. When I first began writing, I tinkered with a story about Irish mail-order brides (the whole mail order bride thing just fascinates me). Hubby read it, told me it “wasn’t bad,” then suggested I write our story. Skeptical, I questioned him. “Are you sure. I mean you don’t look so good in that story for a long time.” He grinned and responded, “Yeah, but I think it turned out all right.” I’d have to agree. We celebrated our 28th wedding anniversary in mid-June. Are there any fun titbits about this story you can share with us? Because the characters are based on my husband and myself, some of the dialogue comes directly from our conversations and there are many “inside jokes” included in the story that hopefully convey to the reader the playfulness between hubby and myself. For example, my hero, Benjamin Coulter, learned to make pies and cookies from his grandmother, just like my husband, Mike. When Ruth Ann serves the apple pie Benjamin made, she took care to steal the point from both their pieces, surprising Ben. This mimics our own tradition of stealing the point from each other’s pie. Not to be outdone by “Ruthie,” Benjamin sneaks into the kitchen and cuts a hole in the center of the other pie—making certain no slices will have a point! I’ve had several comments from readers about this scene. Let me tell you, yes it happened just that way—Thanksgiving 1990, our first Thanksgiving together as a married couple. The thing that I really found funny was that hubby just let the pie sit on the counter, confident I’d discover it at some point. My jaw dropped when I saw the hole in the middle of that beautiful pie. What a stinker! Since I’ve always been a huge history geek, setting the story in the 19th century was an obvious choice. I’ve lived in Loudoun County, Virginia, in the foothills of the Blue Ridge mountains, since 1972. My fictionalized town of Catoctin Creek is loosely based on my hometown of Purcellville, Virginia. In 1874, the Washington & Ohio railroad opened their station in Purcellville, an event that I capture in A Love Restored. My hero, Benjamin Coulter, is an apprentice surveyor with a Land Mapping Agency responsible for the route the new rail line will take. Where were you born? Alexandria, Virginia about 45 minutes from where I live now. If you could live anywhere in the world, where would it be? Definitely in Virginia, but I’d like to go into the mountains more—perhaps Smith Mountain Lake, Pearisburg or even Lexington (though that’s more of the Shenandoah Valley I suppose). What is the funniest thing that ever happened to you or you witnessed that made you laugh so hard you couldn’t catch your breath? This past May I attended the Blue Ridge Mountain Writers Conference. One of the continuing education classes I took was “Speaking for Writers.” As part of the class we had to give a five-minute presentation. I thought we were all beginners but as the ladies took their turns it became obvious they were way more polished and experienced than I was. I started panicking and my mind quickly devised a list of excuses to try and get out of the assignment. As soon as we were dismissed I headed for the nearest bathroom. Relieved to find it unoccupied, I made a bee line for the large handicap stall. Frustrated that fear was ruling my heart and mind, I gave myself a good talking to. “What is the matter with you Goshorn. Get a grip. Stop crying like a baby. You know better. How many times are you gonna fight this battle? You know the Lord is calling you to do this.” About now I’m finding my stride, the Holy Spirit is rising in me and I know the devil is gonna get a good old-fashioned but kicking. “You are a child of the King and you don’t have to take this crap from anyone! Satan, in the name of Jesus, I’m telling you to get out of my head. You are defeated!” As the sweet peace of the Holy Spirit began to wash over me, I heard a voice -- in the next stall say, “Amen! Preach it, girl!” Turns out I wasn’t alone after all. What music groups/artists blast from your CD player while you write? Although I make playlists that inspire me for the story I’m working on (usually a mix of country and Christian songs), I typically listen to those when I’m mowing the lawn or riding in the car. When I’m writing, I need music without words, so I usually listen to classical or Big Band music. Name some of your most favourite things. Besides the obvious—family, friends & God? The colorful leaves in autumn, the view of the Blue Ridge mountains when I crest the summit at Clark’s Gap, my mother’s vegetable soup and my husband’s apple pie (with a crust from scratch), my Welsh corgi, Levi, an old, cracked pitcher and basin from the Criste farm (my paternal great-grandparents), playing Euro-style board games, and watching period dramas on the BBC. Why did you begin writing? How long have you been writing? I’ve been writing since 2010 and truthfully, I never saw it coming! So many writers I’ve talked to have wanted to be a writer since they were a child. Many have drawers full of half-written manuscripts. Me? Not so much. I had always enjoyed writing papers for my college classes, but I NEVER considered writing fiction. I’d been a successful in-home childcare provider for nearly twenty years, but I knew in my heart it was time to move on to something new. My husband and I began praying for God to give me a new direction, a new passion in my life I would undeniably know He’d planted in my heart. On a whim, I began tinkering with story writing and it didn’t take long for my secret hobby to become my God-given passion! When you write do you start with a plot outline, a character sketch, how do you begin? How do you stay on course? Since A Love Restored was based on my real-life romance with husband, Mike, I knew the basic plot line. But when I attempted to write my next story from scratch, I discovered that I’m not much of a plotter. That surprised me because I’m typically a very detailed, list-oriented type of person in my non-writing life. I usually write a character sketch for each of the principals and jot down any plot points I may know and then get started. If I get stuck, I call in reinforcements—close writing friends who will brainstorm with me. Are you working on anything at the present you’d like to share with us? I’m very excited about the series I’m working on now, Surrendered Hearts. Set in Civil War Virginia, the series follows the Ashby family as they experience devastating losses and examines what happens when God calls us to surrender those things we hold most dear. This story will be set in nearby Hillsboro, Virginia, also in Loudoun County, not far from Catoctin Creek. Right now, I’m reading For Love of Liberty by Julie Lessman. 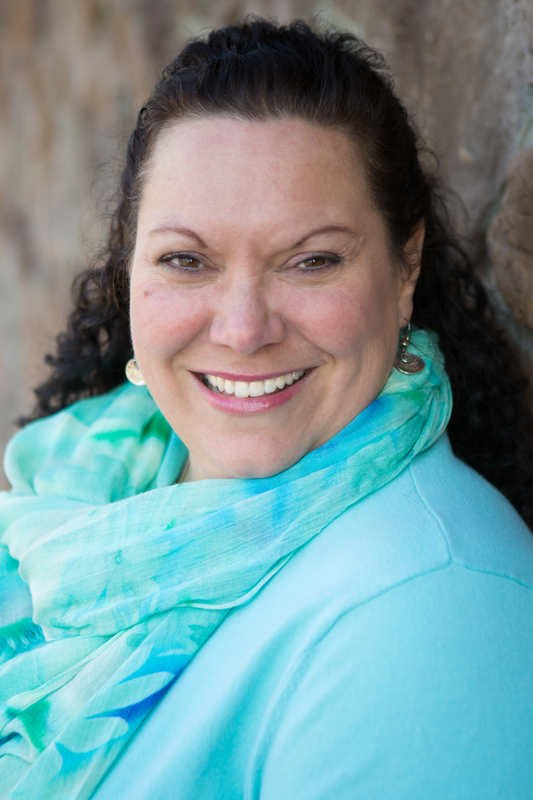 Books like Stealing the Preacher by Karen Witemeyer, To Whisper Her Name by Tamera Alexander, and A Passion Most Pure by Julie Lessman have not only entertained me but challenged me as a writer. I would love to have the combined artistry of these amazing writers—Karen’s humor, Tamera’s amazing descriptive talent, and Julie’s passion! That woman knows how to write a kiss! Umm…writing space? Have laptop will travel could be this writer’s tagline! LOL! I do have a desk in my crowded bedroom I use sometimes but because I get up very early, I usually write downstairs in the morning either at the kitchen table or the sofa. If the weather is nice, I might be found out back on the screened porch. I do dream of a lovely space to call my own like I’ve seen other writers post (like Deborah Raney) but I’m not jealous. No, not me. I found it challenging to write my characters, Ruth Ann and Benjamin, who both struggle to come to terms with Ruth Ann’s fuller-figure, without making her look weak and pathetic nor him look shallow. I hope readers find them to be strong, good-hearted characters struggling with very human flaws who look to God and scripture for guidance and healing. The series I’m working on now, Surrendered Hearts, was largely inspired by country music songs like “Sweet Annie,” by the Zac Brown Band or “The Man I Want to Be,” by Chris Young as well as Christian titles like “Come to the Altar,” by Elevation Worship. Do you really, really want a dog? Yes! I have one Welsh corgi, Levi, but I really, really wanted two dogs. I wanted to name them Mario & Luigi. Hubby said no. What is your heritage? European--primarily Irish on my father’s side and German/Prussian on my mother’s. Although my sister recently had her DNA tested through Ancestry.com and we were surprised to discover we had about 17% Scandinavian as well. My sister loves to research the family genealogy and is working on an application for the Daughters of the American Revolution. Both sides of my family emigrated to the U.S. prior to the Revolution and we have at least one known direct ancestor who served in the Pennsylvania Rangers during that time. Have you ever cried during a movie? All the time. I cry at Hallmark commercials, and reading greeting cards in Target, and looking at old pictures of my kids, and reading romance novels . . . basically, I’m an easy cry. Do you sleep with the light on? No, but I often fall asleep with one on while reading. What is your favourite pizza? Oh, tough question. Toss up between Hawaiian (ham & pineapple) and veggie (green peppers, onions & mushrooms). Are you a morning person or a night person? Morning—early riser. Alarm usually goes off around 4:45 am and I’m out of bed by 5. If you could see anyone tomorrow (dead or alive), who would it be? Probably my dad. He passed away when I was 13. This year will be 40 years since died. That’s unbelievable to me. When my sister was dying a few years ago, I would hold her hand and tell her, “you get to see daddy.” I was truly a bit envious. 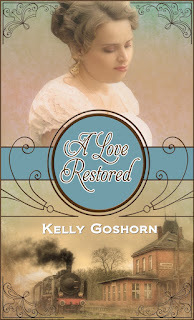 Kelly has an ecopy of A Love Restored to give away. Each commentator will be entered into a hat draw to win. Please leave an email address by which Kelly can contact you with your answer to her question. Your Turn: Since A Love Restored was set in Virginia and Kelly has lived there most of her life (except for a few short stints in the foreign countries of California and New York), she’d like to know where you’re from, how long you’ve lived there, and if you’d stay put or move somewhere else if you could. I loved "A Love Restored." I think most people fear public speaking. I know my heart gets a workout! LOL @ that bathroom story. True Story, Ruth! I'm surprised you didn't hear that one at Blue Ridge! I have a million goofy stories like that about myself! I seem to be a natural! Hi Marilyn, thank you for your kind words and for stopping by today! Hi Pam, Thanks for visiting today! Hi Barb, thanks for your kind words about A Love Restored! You are quite the cheerleader! Thanks for stopping by! This was a great interview! Makes me want to read the book even more now! I live in Oklahoma (11years now), but I’m originally from the suburbs of Chicago! Sometimes, I’d like to move from Oklahoma, but we’ll stay put- the kids go to a great school and I don’t want to mess that up! I grew up in Illinois and moved to the Oregon coast in 1996. I love it here and don't plan on moving away! :-) It's beautiful out here and you can't beat small town living. Enjoyed your interview. Blessings to you. Great interview! Can’t wait to read the book! I enjoyed your interview. the book sounds interesting. thanks for the giveaway. Hi Tiffany, I've never been to Oklahoma but I'm hoping to travel to all 50 states. Thanks for visiting. Hi Trixi, Oregon is another place I've never been. I've heard the coast is gorgeous. Thanks for commenting. Hi Carol, Thanks for visiting today! Hi Shirley, Nice to see you here on Clare's blog! Thanks for your kind words! Blessings! Great interview! I am really looking forward to reading this book!! I would love to win a copy! Thanks for the chance!